“Услед Змёрзламу Сонцу” begins with a 6 minute ambient atmospheric intro, preparing the listener for the main album. 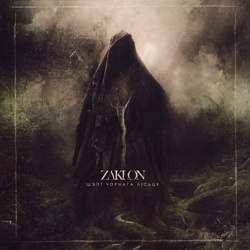 Zaklon offer excellent melancholic black metal of raw, but very melodic nature. The compositions are based on the wonderful guitars riffs that move mostly in mid tempo rhythms, creating a sad, sombre, depressive atmosphere, with the help of acoustic guitars and few synths. They have also some faster and more aggressive outbursts, never losing their sense of melody. Even if the few folk elements of the debut full-length are now almost vanished, their sound retains its pagan aura. The album title translates to “Whisper of Black Foliage” and its lyrics (all in their native language) are inspired by Autumn’s withering, something perfectly reflected in their music. Temnarod’s screaming vocals are exactly as they should be, raw and full of bitterness, combined with a few atmospheric recitations. The addition of melancholic clean vocals in the seventh track “Голас Крыві” is very interesting, making this song my favorite. I really hope he uses them more in the future! The album includes 9 songs, lasting totally for 56 minutes. Except for the drums, that still need some improvement in order to sound more natural, their overall production and especially the guitar sound is very good. Zaklon is a really great underground black metal band, totally recommended, especially if you like a dark, pagan melodic touch in this genre. “Шэпт Чорнага Лісьця” is released by Gardarika Musikk in a 2-panel digifile, with a 2-page insert including the lyrics. The wonderful artwork / illustration is by Al.Ex (project Mayhem) and is different from the original release. There is no official page of the band, so if you want more info about them you can visit their label’s site. By the way, Gardarika Musikk has recently released Zaklon’s 3rd album “Сымбалi Нязбытнага“.